South Korean actresses, Han Chae Young (한채영) and Gong Hyo Jin (공효진) both attended Mue Fall/Winter 2013 fashion show held in Seoul, South Korea on April 26, 2013. Pregnant with her first child, Han Chae Young (한채영) wore an 'Aria' printed blouse from Mary Katrantzou Spring/Summer 2013 collection. A black knitted skirt, clutch and oxford pumps. Maternity chic! Get a similar 'Aria' printed blouse on Net-A-Porter. 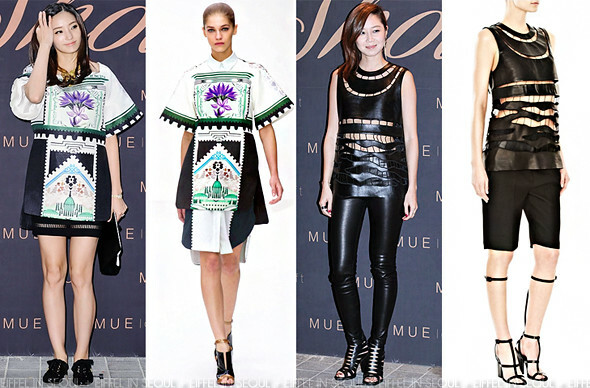 Gong Hyo Jin (공효진) wore a black zebra suspension blouse from Alexander Wang Spring/Summer 2013 collection. Black leather pants and a pair of cut-out booties to accessorize her look.